Nima is a small portable device that quickly and easily detects gluten in food. By providing fast feedback, gluten-free life could get a whole lot easier - before and after meals. Food consumption anxiety in social situations is why Shireen Yates, CEO and co-founder of 6SensorLabs, describes her company’s first product, Nima, as a “social enabler”; it’s a device that analyzes small pieces of food for allergens using a chemical-based test. In under 2 minutes, the first incarnation of the patent-pending Nima – named one of TIME magazine’s “Best Inventions of 2015” – can decipher whether the food you are about to eat contains gluten, thereby giving you the peace of mind and confidence to enjoy your dining experience, without the fear of a reaction that can have you running for the restroom. The National Institute of Diabetes and Digestive and Kidney Diseases estimates that as many as 1 in 141 Americans has Celiac disease, but many people don’t know they have the condition. Gluten-sensitive people experience similar symptoms to those with celiac disease. Eating anywhere away from home can be a minefield for people with either condition, who can suffer issues from stomach pains and upset, swollen joints, to other debilitating health problems if they eat even a small amount of gluten. Other products on the market for testing food include EZ Gluten, TellSpec or SCiO. TellSpec and ConsumerPhysic’s SCiO — which are both pre-launch — share similarities in their use of spectroscopy technology, and their scan results detect more than just gluten. What makes Nima different is the technology; it uses a custom chemical process to identify gluten, rather than spectroscopy. 6Sensor believes that using antibody-based detection for gluten will yield more sensitive results. “We wanted to be able to detect at one part per million of a protein, to say confidently that a sample had something or not,” says Shireen. Shireen sees a psychographic as opposed to a demographic target for Nima. It’s a target that revolves around the insecurity of eating out, and one encompasses a wide range of users – from the mother with kids to the retiree – united in their fear of not knowing what is in their food. ■ Step 1 ­ Place a small amount food into the disposable capsule and screw on the cap. ■ Step 2 ­ Insert capsule into the device. ■ Step 3 ­ Press the power button. After two minutes you’ll get a smiley face or a sad face depending on whether your food contains gluten. The test will identify if a food has at least 20 parts per million or more of gluten – in line with the U.S. FDA rule for gluten-free labeling. An important part of the Nima value proposition is that a community component is offered, with the ability to share food test results with other users via an iPhone app. App users will be able to view previous test results before dining out and report new results from their own meals. 6SensorLabs claims that the device has been tested and re-tested by their science team. Third-party validation is in-process and they promise to release validation data on their device in the upcoming months. Gluten is just the first of many proteins with which 6SensorLabs sees a future for Nima. Tests for peanut and dairy are already in the works to be released after gluten. “We field new requests from customers every day for additional food sensitivities and substances for which they’d like to test with Nima, and our goal is to develop a test for each one in the future,” says Shireen. 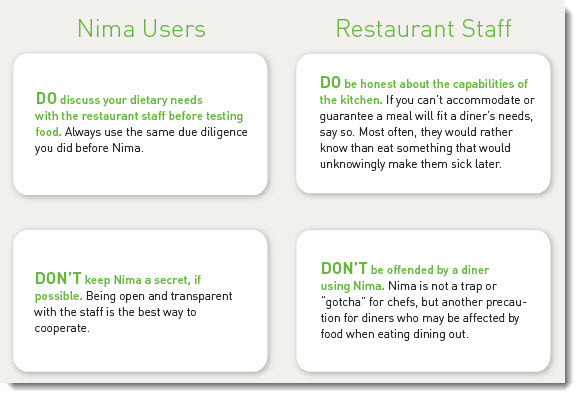 To help Nima users overcome tricky in-restaurant situations, 6SensorLabs has compiled a few basic dos and don’ts in the form of an etiquette guide for dining out with Nima. The guide is intended to help users and restaurant staff better understand how to work and dine together as they explore new food technology territory together. The etiquette guide also discusses the tricky and complex issue of cross-contamination. Since Nima can only test a certain portion of food, its use as an identifier of cross-contamination might be limited. Some food could still contain gluten but show a negative result and the use of Nima could create a false sense of security. On the other hand, a false positive could have a diner wanting to return a meal that in fact contained no gluten. Nima is now available for pre-sale on the 6SensorLab web site: the Nima Starter Kit for $199 and the Nima Starter Kit + 12 Pack of Capsules for $247. Pioneering tech like Nima is putting the power of data, detection, control and mostly comfort into the hands of the consumer. $247 with recurring monthly costs isn’t peanuts, but the confidence and peace of mind that comes from knowing the food you are about to eat isn’t gluten? Priceless. It’s a great invention, but very over priced for those of us living on a fixed income. My sister would be first in line for something like this. She would see the cost and justify it in more ways than one when you are dealing with an allergy. Hmm, in a pinch, I guess you might have to know about the gluten. The cost just seems to be out of line. I guess there is a small group of people out there that would “need” this. If I were allergic to gluten or whatever, I would already know what foods to avoid. Hmm, I was just reading about gluten and how it can affect your body. Being able to detect that gluten product with something so portable is a nice advancement in technology.